A nice, tasty side dish/snack and prepared in 2 minutes! Thanks to our Featured Foodie, savourthesensesblog.com, for this recipe. 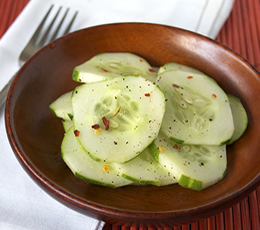 Combine all ingredients in a bowl and mix, making sure all cucumber slices are submerged in the vinegar. Let marinate for at least 10 minutes before serving.